Obviously, the first thing I thought about for this late January post was a red dress for Valentine’s Day. My original plan was to whip up one of the new McCalls early spring patterns, M7534. It looks like a fairly simple pattern that could be whipped up in a time for Valentine’s Day for all you procrastinators (like myself) and could be dressed up or down. 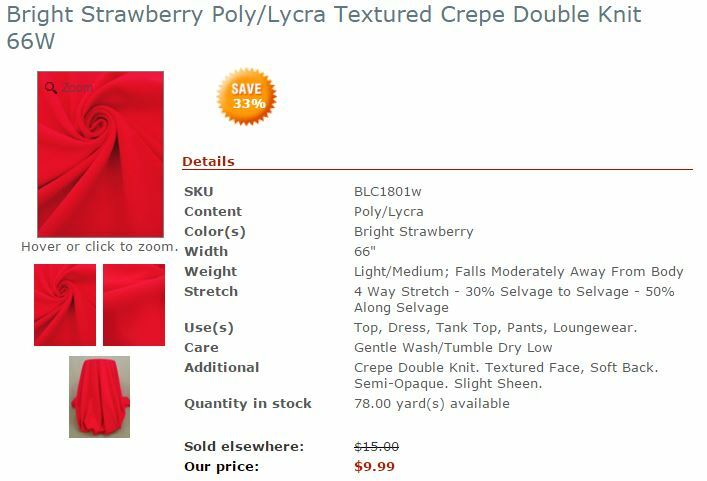 I hurriedly check the website for a red fabric and I decided on this Bright Strawberry Textured Crepe Double Knit from Fabric Mart. Well as soon as it arrived I knew I would have to change my plan. I guess I was so wrapped up in the strawberry color and the crepe texture that I overlooked the double knit part. This fabric was too heavy for a pattern that calls for crepe, stable knits or challis as M7534 does. My bad as it is clearly described as light/medium and double knits are on of my favorite types of knit, so I should’ve known better. Again I think I stopped reading at crepe. Still I loved the fabric, the body, the texture the color, the fabric is amazing! I am thinking about purchasing the grape color. How did Fabric Mart know red and purple are two of my favorite colors? The bright strawberry version is actually an interesting color it is a pinkish-red. I think from a distance it looks red but if you hold it against a true red it starts to look pink. Either works for a Valentine’s dress! I chose Vogue 1513 which I had recently purchased after eyeing it for a while (basically ever since I saw Erica Bunker‘s version in white). The flounce at the neckline intrigued me and I love this silhouette (even if my body doesn’t anymore LOL). Ponte knit, along with wool crepe and wool jersey are the recommended fabrics. SECRET: Because I prefer the comfort of knits (who doesn’t love a little breathing room) I never hesitate to use a stable knit on dress fitted dress patterns that call for wovens. I may go one size down depending on the amount of stretch but I haven’t had any issues. At this point in my sewing journey I typically sew garments without looking at the instructions, however I wasn’t sure how the flounce fit in to the process so I actually followed them fairly closely. I have to say the instructions were very clear! I’ve never seen interfacing applied directly to the main fabric as it is on this pattern. Interfacing is applied at the neck and arm holes as well as the zipper and vent areas. The flounce was a pain to cut because of its irregular shape and all the marking that needed to be transferred but sewing it and attaching it to the dress was simple once I understood how it was attached. (again the instructions were clear) The rest of the dress is simple as it is just a princess seamed dress. The lining adds a little time to the construction but not much. I wasn’t sure how I would felt about the collar going into this project, but I wasn’t sure how to omit it. In the end I don’t mind the collar and feel it is necessary given the construction of the neckline. The one issue I did have was attaching the lining to the collar. At this point the bodice front and back are interfaced as well as the collar which has double thickness and you are to attach the lining. This is 3 layers of fabric and 3 of interfacing plus the lining you are attaching! I had to go slow on my machine to get all of this through. Perhaps if I had used jersey or lighter crepe this wouldn’t have been an issue. I cut a size 14 at the bust and then graded to a 16 at the waist and hips. After constructing the main fabric I tried on the dress and decided I to remove about 1/2″ from the side seams as well as use a 3/4″ SA for the center back. It was not loose but in a knit I wanted closer fit to allow for some stretching. (Also I plan on loosing some weight this year-I just joined a 12 week challenge- so I did want it to be too large in the future). I’m sure a 14/16 would work for a non stretch or a low stretch woven. All in all I love this dress. I’m not sure I would sew another right away as the dress itself is distinctive, but I would love another one in black or white. We’ll see. Pattern Description: Fitted, lined, sleeveless dress has princess seams, stand-up collar cut on the bias, back slit, invisible back zipper, and pleated drape detail. Dislikes: I thought I would dislike the collar but I don’t mind it. Pattern alterations or any design changes made: none, I ended up taking the dress in. Would I sew it again? I’m not sure how many shoulder flounce dresses I need, but I might sew it again minus the flounce for a simple princess seam sheath dress. I would cute a 14 if using a knit fabric. Would I recommend it to others? Yes if you want a princess seam dress with a little flair. Conclusion: Great elegant dress pattern. ***This is a partnered post with FabricMart Fabrics. They did provide the fabric at no cost but all thoughts are my own. Very pretty and perfect for Valentine’s Day. Lovely dress! Both the color and style look great on you. 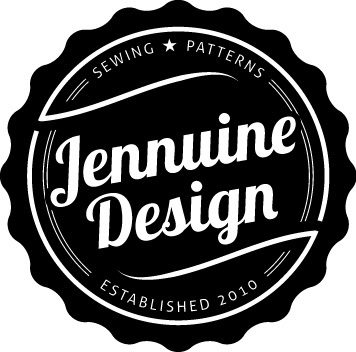 Thanks for the tip regarding the use of knits with fitted dress patterns designed for wovens. I shall definitely explore that! Saw your post on the Fabric Mart Blog and just wanted to let you know that your dress is stunning. This dress is da bomb on you! Nailed it. This dress is gorgeous. It looks terrific on you, too. Perfect for Valentine’s Day! Gorgeous dress! The color, fit and pattern work so well together.